Manchester’s creative economy – where to next? If this doesn’t ring any alarm bells, the almost complete absence of any initiatives that may benefit, promote or support artists in the region may do. Manchester has no visual arts biennial, no art prize (like Liverpool), no annual open submission competition (like the London Open at the Whitechapel) no purchase schemes, and no artist residency programmes at its biggest institutions. We’ve never been in the running for European Capital of Culture. In fact you’re more likely to see a Manchester artist working as a gallery attendant than exhibiting in the city. If we want artists to live and work in the region, rather than moving south in search of opportunity, our major galleries must join hands with the artist-led sector to nurture a fully integrated visual arts ecology. Artists contribute far more to a region’s tourism, academic, service and construction sectors than they ever absorb through direct public subsidy. They revitalize neglected zones of the urban environment and lend cultural prestige to a city’s portfolio of attractions. The Arts Council’s attempts to support excellence and diversity, including aesthetic diversity, are foundering on their agenda of driving public-funded institutions towards the open arms of the private sector in the attempt to broaden income steams. The commercial art world in particular, is founded on exclusivity, with self-appointed ‘gatekeepers’ promoting their own vested interests and excluding the vast majority of practitioners. Imagine turning up at hospital to be told that you’re not welcome because you haven’t been to dinner with the administrator. An independent report (http://www.theroccreport.co.uk) concluded that there’s an urgent need for investment in arts production outside London. Nevertheless it failed to critique the rampant croneyism that is infesting the museum sector and leading to homogenization and stagnation in the visual arts. In his book ‘Dark Matter’ (2011) Gregory Sholette talks about the ‘structural invisibility’ of most artists. The passion and dedication of Manchester’s artists and the legendary DIY spirit of our great city can only carry us so far. Artists deserve the widest possible audiences and a platform alongside the international talent that visits the city. Manchester deserves to experience the greatest art in the world together with the greatest art from right here. The arts community must come together and make it happen! This entry was posted in Interventions and tagged Arts, Economy, Manchester, Policy on May 27, 2014 by citiesmcr. Nik Theodore from the Department of Urban Planning and Policy of the University of Illinois at Chicago writes about the problem of wage theft in the United States. Ana is not alone in experiencing these types of workplace violations. Increasingly, it is clear that there has been a breakdown in the enforcement of core employment and labor laws in Chicago and other major US cities. Employers must pay workers at least the minimum wage, and time and a half for overtime. They must follow regulations to protect workers’ health and safety, and carry workers’ compensation insurance to cover on-the-job injuries. They may not discriminate against workers on the basis of age, race, religion, national origin, gender, sexual orientation or disability. And they must respect workers’ right to organize and bring complaints about working conditions. Yet there is growing evidence that employers are evading these bedrock labor standards. A study of workplace violations in Chicago, Los Angeles and New York City (http://www.unprotectedworkers.org/index.php/broken_laws/index) found evidence of widespread violations among workers employed in low-wage industries. In the Chicago area, the nonpayment and underpayment of wages take a heavy monetary toll on workers and their families (http://www.ndlon.org/en/resources/item/412-unregulated-work). For those workers who experienced a pay‐based violation in the previous week, the average amount of lost wages was $50, out of average weekly earnings of $322. This amounts to wage theft of 16 percent. Assuming a full‐year work schedule, it is estimated that these workers lost an average of $2,595 annually due to workplace violations, out of total annual earnings of just $16,753. Furthermore, it is estimated that in a given week, approximately 146,300 workers in Chicago and suburban Cook County experience at least one pay‐based violation. Extrapolating from this figure, front‐line workers in low‐wage industries lose more than $7.3 million per week as a result of employment and labor law violations. Wage theft not only depresses the already meager earnings of low‐wage workers, it also adversely impacts their communities and local economies. Low‐income families spend the large majority of their earnings on basic necessities, such as food, clothing and housing. Their expenditures circulate through local economies, supporting businesses and jobs. Wage theft robs local communities of a significant portion of this spending, and it ultimately limits economic growth. Kim Bobo has correctly referred to wage theft as the “crime wave no one talks about.” It is high time that policymakers confront labor standards violations and their detrimental impacts on families and local communities. The policy agenda must include updating employment laws so that they apply to 21st Century workplaces and employment arrangements, redoubling enforcement efforts to strengthen the effectiveness of laws that are on the books, and ultimately devising strategies to hold employers responsible for the workplace conditions under their control. This entry was posted in News & Updates and tagged chicago, Coalition Government, Economy, Planning, Policy, Politics, United States, wages on May 19, 2014 by citiesmcr. It all comes together in … Hebden Bridge? In this second blog post about Evan Davis’s recent BBC series, Mind the Gap: London v the Rest, Iain Deas, Graham Haughton and Stephen Hincks from Planning and Environmental Management in the School of Environment, Educaton and Development at the University of Manchester look at the intriguing suggestion that policy support might in future concentrate on promoting growth in a trans-Pennine super-city radiating outwards from Manchester. In doing so, they draw on a wider critique of ‘agglomeration boosterism’ they began to develop in an open access paper published last month in Environment and Planning A. The case for a trans-Pennine super-city drew on the now familiar argument that bigger is better in respect of urban economic development: that large cities are associated with higher levels of prosperity and productivity. Citing Word Bank research linking increased city size to raised productivity, the programme frustratingly left unexplored the direction of any causal linkage between population growth and economic development. Instead, it asserted that “if you could make Manchester the size of London (by doubling it and doubling it again) you would expect it to be about 6% to 16% richer”. Thus, what is needed is “the creation of a far bigger second city – one of several million people, which could serve as a counterweight to the mighty force that is the capital” (Davis, 2014). Manchester and Birmingham, on the grounds of their size and international standing, were presented as the most realistic candidates to assume this status as Britain’s second global city. A survey commissioned for the programme showed Manchester as the preferred second city, if nothing else illustrating the effectiveness of the city’s efforts to transform its external perception as the quintessential ‘dirty old town’. But the programme also offered another way forward: creating a polycentric super-city by encouraging stronger linkages between existing urban areas along the M62 motorway corridor. Suggesting in partly jocular fashion that the commuter town of Hebden Bridge in West Yorkshire possesses the London-style sense of cultural tolerance and liberal mindedness to act as symbolic link between the great Victorian industrial cities on either side of the Pennines, Mind the Gap argued that investment in infrastructure and complementary economic specialism could create a super-city straddling the functional economies of Leeds, Manchester and Liverpool. Sources: Manchester and the Hulme Arch (Graham Haughton); Rochdale Canal, Hebden Bridge (ManAlive!, flickr.com, Creative Commons license). The idea of enhanced inter-city cooperation, or of a trans-Pennine super-city, is by no means new. In the mid-late-1990s, some of our colleagues in Planning and Environmental Management at Manchester produced a series of studies articulating the ways in which a trans-Pennine regional growth corridor, from Liverpool to Hull, could be developed. This in turn prompted interest from the European Commission, and armed with Interreg funding the trans-Pennine corridor eventually extended beyond its northern roots to form a North European Trade Axis stretching from Dublin to Donetsk. This, and other ideas like the starchitect Will Alsop’s proposal in 2005 for a super-city along the M62 motorway, helped for a short time to generate political interest. John Prescott’s Northern Way, again linking the M62 cities but with an additional branch to Newcastle, was proposed as a new growth corridor, helping to bridge the ‘£29 billion gap’ in economic output between the northern regions and London. The notion of increased inter-city collaboration – or even a pan-regional super-city – has been persistent, but fulfilling it has proved frustratingly elusive. Much of the initial political momentum underlying the Northern Way rapidly dissipated as the constituent cities reverted to more insular policy-making and produced a series of separate (and only nominally linked) city-region development plans, rather than a coherent pan-regional collaborative strategy. This is just one illustration of the difficulty involved in persuading cities with distinct political, economic and cultural histories to work together in any meaningful way. The potency of longstanding parochial rivalries in limiting the scope for meaningful inter-city cooperation is compounded by government efforts over more than thirty years to foster competitive localism and encourage cities to compete with domestic and international rivals for policy resources, skilled labour, inward investment, prestige events and so on. In this context, it is hardly surprising that many inter-city collaborative initiatives should founder. The Liverpool-Manchester Vision – an attempt from 2001 by the North West Development Agency to promote greater collaboration around external marketing to visitors and inward investors – unravelled amid inter-city acrimony about the location for its launch event. More recently, efforts to agree a name for the new Merseyside combined authority have come unstuck over resistance amongst the city-region’s satellite districts to the use of ‘Liverpool’ in the title of the new institution (‘Halton, Knowsley, Liverpool, St Helens, Sefton and Wirral Combined Authority’ is the less than catchy interim compromise). Securing agreement amongst reluctant constituent areas is just one of the obstacles confronting efforts to construct the kind of super-city mooted by Evan Davis and others. Infrastructure investment in the North, especially in the rail network, was rightly highlighted by Mind the Gap as an important way of cultivating links between cities. Evidence to date suggests that existing links are inadequate and the necessary investment unlikely to be forthcoming. The programme correctly noted that while HS2 and Crossrail involve billions of pounds of expenditure on improving transport to and within London, resources allocated to trans-Pennine linkages are slender by comparison. Indeed, at the time of writing Parliament is debating the announcement that some 13% of the rolling stock on the overcrowded trans-Pennine rail route is from 2015 to be diverted to meet capacity shortages in the South East (Parliamentary Business, 2014). And even when investment has proved forthcoming, as with the electrification of the Manchester-Liverpool rail line to form a high(ish) speed connection along the route of the world’s first inter-city passenger railway, this has been dependent in part on new infrastructure development in London generating surplus rolling stock to be refurbished and redeployed in the provinces. The ability of northern cities themselves to invest in developing new infrastructure or improved links – or to develop their economies more generally – is also constrained. Government’s localist rhetoric implies that cities have been ‘liberated’ and are free to develop whatever policy innovations they deem appropriate. However, the reality, given that austerity measures have impacted on local government more than any other part of the public sector, is that the ability of cities to effect economic change is highly restricted. The prospect of local agencies promoting meaningful economic development is perhaps especially limited in the cities of the north, given that it is provincial regions that have borne the brunt of public sector employment losses. 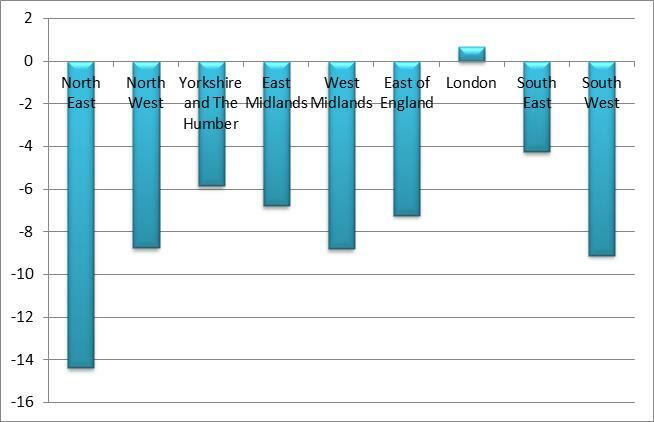 Indeed, as Figure 2 shows, the only English region not to experience a net loss of public sector jobs since 2008 has been London. The history of London-centric decision-making, and its recent parallel logic that what’s good for London is good for the rest, continues to blight the prospects for development for the country as a whole. Two things are left unanswered by recent calls to focus more resources on just a small number of large cities because of their supposed contribution to national productivity. First, why should the ‘The Rest’ – people outside London and other potential growth areas – accept their taxes funding disproportionate investment in apparently already buoyant urban economies? And second, do we really want to live in a country where decisions about the geography of public spending pander to a highly questionable economistic logic that attaches undue importance to inducing gains in a dubious concept like productivity? Better to think in broader terms, to the benefit of London, Manchester… and Hebden Bridge. This entry was posted in Interventions and tagged Economy, Manchester, Policy, Politics on March 31, 2014 by citiesmcr. In a recent BBC series, Mind the Gap: London v the Rest and an accompanying BBC blog (http://www.bbc.co.uk/programmes/b03xp6x7), Evan Davis put forward an argument that government should do more to help large and successful cities prosper – even though this means spending less elsewhere. Central to the case was the notion that cities are best able to prosper when they have dense networks of highly skilled and creative workers intermingling in close proximity, driving innovation and promoting high-value economic activity. Both local and national economic development policy, the programme argued, ought to concentrate support much more exclusively on the small number of cities that can fulfil this role as epicentres of knowledge-driven economic vitality. The programme singled out London as an exemplar of this form of urban economic development. The dramatic transformation of the city’s economic fortunes over nearly thirty years, it was argued, was attributable to its ability to attract and retain skilled mobile labour from around the world, lured by a seductive mix of vibrant cultural environments, attractive neighbourhoods and the prospect of rapid economic enrichment. Amid predictable images of self-congratulatory, coffee quaffing metropolitan hipsters, the programme argued that London’s growth should be celebrated and promoted. Although there was acknowledgment of some of the problems associated with rapid growth and overheating – strains on infrastructure, acute housing shortages and the social and spatial marginalisation of residents left behind – these were presented simply as impediments to further growth that policy intervention should and could circumvent. London’s prosperity, ran this argument, ought to be facilitated by accommodating growth pressures: providing developable land, ensuring a supply of affordable housing, investing further in infrastructure and continuing to meet demand for labour by stressing the city’s openness to newcomers. Mind the Gap was in some ways an entertaining and deliberately provocative piece of television. What is interesting, though, is that it echoed much of the orthodoxy that many would argue infuses contemporary urban economic development policy – not least in Manchester. In an open access paper published last month in Environment and Planning A (http://www.envplan.com/abstract.cgi?id=a130335c) we began to question the sorts of academic idea that underpinned Mind the Gap. Building on this, we want in this two-part blog to critique two of the ideas central to Evan Davis’s thesis. In this first post, we assess Davis’s contention that London’s ascendancy ought not only to be tolerated, but should be actively promoted by government as the best way of driving national prosperity. In the subsequent blog, we review the second episode of Mind the Gap, which argued that by concentrating resources in a network of linked urban areas as part of a northern super-city, England’s provincial cities might begin to develop new agglomerative economic growth and follow London’s path to success. Evan Davis’s treatise said relatively little about the role of policy in underpinning London’s transformation from merely another declining British city in the 1970s to the thrusting global city of today. Indeed, implicit to the programme was an argument that spatial policy had been trained to too great a degree on the declining cities of the north and midlands, to very limited effect. At the same time, earlier policy efforts to manage the growth of London itself – via green belt policy or the new towns programme – were said to have undermined the city’s economy by restricting in situ development and diverting development elsewhere. This ignores the instrumental role played by government in enabling London’s growth. The emphasis of national policy, at least until the onset of the crises of 2007-08, on promoting the financial and producer service sectors has been a major part of this. So too has been associated spending, aimed at accommodating London’s growth via multi-billion investment in infrastructure. What is less frequently acknowledged, however, is that public expenditure in general has also been skewed towards London. Treasury data on per capita identifiable public expenditure on services for standard regions give some sense of the capital’s favourable treatment (Figure 1). 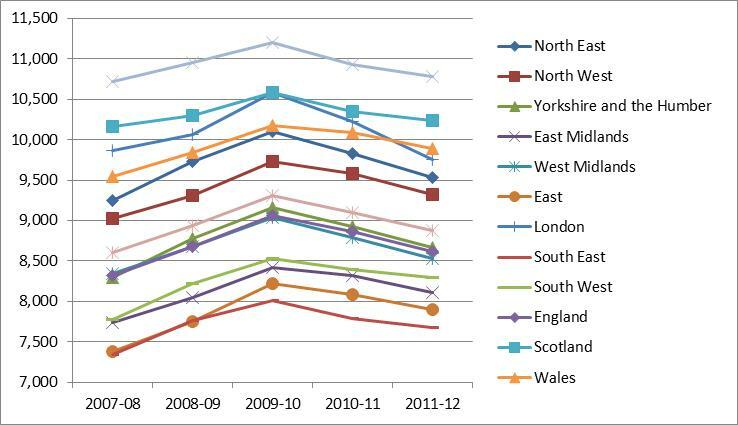 London, the graph shows, is consistently the best funded of the English regions, and exceeded only by the special cases of Northern Ireland and (to a lesser extent) Scotland and Wales. The unavoidable additional cost of maintaining capital city functions for the four UK capitals, and other complications such as the variable physical size of the regions and their differing social profiles, makes comparison across regions difficult. But the extent of interregional disparity is striking nonetheless – and even greater in terms of specific types of spending, like science and technology and transport, where London and the South East again receive disproportionately larger shares than other English regions. Source: HM Treasury (2013) Public Expenditure Statistical Analyses 2013, Cm 8663, London: The Stationery Office. Available: https://www.gov.uk/government/uploads/system/uploads/attachment_data/file/223600/public_expenditure_statistical_analyses_2013.pdf (accessed 20th March 2014). A dispassionate observer might well conclude that London’s growth has been highly dependent on state subsidy. Moreover, data on disaggregated public service expenditure suggest a pattern for the English regions that runs counter to regional policy. And the sums involved in the latter are, of course, much smaller by comparison with spending on mainstream services. This is important because implicit to the argument of Mind the Gap was a view that past spatial policy has been ineffective in reenergising declining economies, and that public money ought to focus on stimulating agglomerative growth in a few large urban areas instead of trying to narrow interregional inequality. Past policy for cities and regions, runs this line of argument, is wasteful because it is propping-up areas that are less ‘productive’ than London. Yet there is an argument that previous regional policy should not to be so readily dismissed, and that it is unrealistic to expect regional economic transformation given the degree to which regional imbalance has been ingrained over a century and more. Even at its peak in 2005/06, the national budget of £2.2b for Regional Development Agencies (RDAs) represented only 0.2% of national output. And even in the most generously funded of the RDAs – One North East – peak spending amounted to £240m: a mere £95 per person or 0.75% of regional economic output. These are miniscule sums, dwarfed by public expenditure directed towards London. And the contrast becomes even more striking given the abolition of the RDAs and their replacement by Local Enterprise Partnerships, nominally private sector bodies responsible for raising their own resources and benefitting from only modest levels of financial support from government. Viewed in the context of the meagre resources allocated to spatial economic development policy and the hidden subsidy to London and its region, therefore, it is unsurprising that regional economic disparity should prove so intractable. Mind the Gap echoed the view that past policy for cities and regions has detracted from rather than added to national productivity , and that resources could be better used to enable London’s growth to be maintained and to create mini-Londons elsewhere. What was missing, however, was any kind of lateral thinking on how to offset the growth pressures accumulating in the London region. Yet the solution to some of London’s problems of overheating, it could be argued, rests not in the capital, but elsewhere in urban Britain. The sensible response London’s to spiralling house prices, one could contend, lies not in liberalising planning and releasing more land for development, but in focusing economic development policy on struggling cities and regions in order to bolster their demand for labour and displace some of the pressures from the existing hotspots of the South East. Supply-side policies on land and labour in London and the South East over thirty years have failed to resolve growth pressures, hence acute localised wage and house price inflation. Instead of maintaining urban containment and resisting green belt encroachment, concerned residents of the Home Counties might be better advised to lobby for more investment in the north in order to ensure that housing is affordable in the South East. Boris Johnson, London’s mayor, likes to argue that concentrating investment in already prosperous London is justifiable not only because the city is a net contributor to the exchequer, but also because the benefits ultimately trickle-down to the rest of the country. “I’m making the argument to the Treasury that a pound spent in Croydon is far more of value to the country than a pound spent in Strathclyde. You will generate jobs in Strathclyde far more effectively if you invest in parts of London”, he told the Huffington Post in 2012 (http://www.huffingtonpost.co.uk/2012/04/26/job-creation-london-mayor-huffpost-linkedin_n_1456092.html). A rather better argument would be to invest more in Britain’s provincial cities, linked to a genuinely integrative national spatial policy, as the best way of maintaining London’s prosperity. This entry was posted in Interventions and tagged Development, Economy, Exclusion, London, Manchester, Planning, Policy, Politics on March 24, 2014 by citiesmcr. Can Manchester become a cycling city? For cities such as Manchester to operate a fully sustainable transport system they must make cycling mainstream, say Dr James Evans and Gabriele Schliwa. Their study into how to make the vision a reality has policy implications for cities across the UK. Manchester may be the home of British cycling, but does the city fully embrace two wheels? A flat city home to Europe’s largest student population should, in theory, be a biking mecca. But the reality is some way off. Many would-be cyclists are simply put off getting on the saddle at all, even for the slightest journey, be it because of safety or security issues, practicalities, better alternatives or maybe just Mancunian weather! However, as more people see both the economic and health benefits of cycling (and the nationwide boom shows little sign of letting up), so cities need to adapt and make cycling mainstream. If cities really want to fully embrace sustainability then cycling has to be a part of the mix. For a city such as Manchester to see more cyclists on its streets it has to do a number of things – understand the needs of cyclists, experiment with solutions, and learn what works. This means bringing together partners already working on the ‘two-wheels good’ mantra. It was precisely these elements which provided the framework for the Manchester Cycling Lab research project into the state of cycling in the city that we began a few months ago, thanks to funding from the Economic & Social Research Council. Ranked against the likes of London – or even a comparable city on the continent – Manchester would probably admit it has been slow to fully embrace the potential of cycling, while also underestimating cycling usage. At the same time there has been remarkably little research into cycle usage in the city compared to other forms of transport. There is a sense in which Manchester has to catch up. There are lots of exciting initiatives already underway in the city. For instance the Velocity 2025 programme (http://cycling.tfgm.com/velocity/) aims to make cycling a mainstream, everyday form of transport via a network of newly-built or enhanced cycling routes within the next decade. And the Oxford Road Corridor development will ban all cars except taxis along a stretch of the road beside our own university, while at the same time improving pedestrian and cycle facilities. So what exactly have we been doing? Our starting point was to identify the gaps in knowledge that need to be filled in order to facilitate the Velocity programme, working closely with Manchester City Council, Transport for Greater Manchester (TfGM) and local businesses. We then developed a suite of applied projects to address these needs using existing research capacity in the University – most notably in the form of our highly trained and motivated student body. 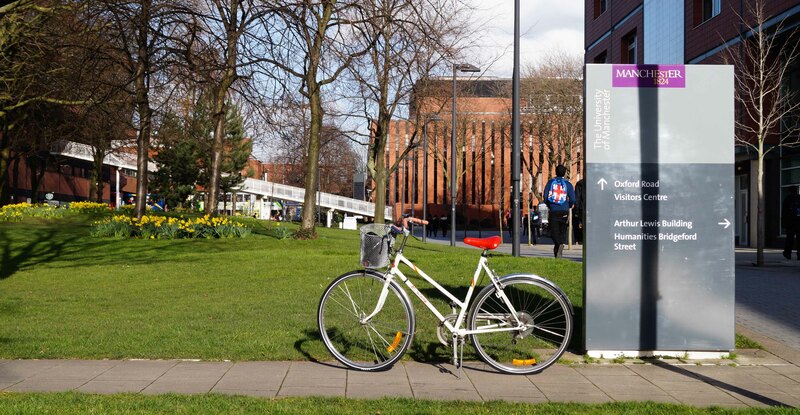 The idea is to turn Manchester into a living laboratory for the study of cycling, harnessing the knowledge and capacity of the University to support a cycling transition. Our portfolio contains about a dozen research projects, tailored to the knowledge needs of our key stakeholders, including a cost-benefit analysis for cycling investment in Manchester; an analysis of the potential to use bikes for delivery services; comparisons with cities such as New York and Berlin that have successfully invested in cycling; and smart planning for bicycle infrastructure. For the latter project masters student Benjamin Bell is investigating whether Strava, a popular app which enables users to track and record their cycle journeys, can be used to understand where people cycle in Manchester. Early estimates suggest more than 12,000 people use Strava in Manchester, which accounts for around 6% of all cyclists in the city, a not insignificant number. We are sending out mailshots to further encourage the use of Strava by regular commuter cyclists to build up more representative data. We set out to learn who already cycles in the city, which roads they use, and how often. We particularly wanted to test the extent to which Strava provided a realistic picture of Manchester’s most popular cycling routes and cyclist demographics. Is it representative of actual cycle patterns? We will be comparing our results with previous TfGMstudies and against real-life counts of cyclists on the same road segments. Although the results are still coming in, the findings are already striking. For instance the vast majority (on average more than 90%) of Strava users are men. But does this reflect the wider uptake of cycling in the city? And those women who do use Strava tend to use more side roads and off-road routes to complete their journey. Surely a demonstration of very real safety concerns among women? The questions ultimately posed by our study are long term. They are as much cultural and behavioural as physical. Can we change the actual mindset of vast swathes of the population and bring them around to the benefits of cycling? As the Manchester Cycling Lab research portfolio shows, we want to compare our work with comparable cities. But in this regard Manchester needs to benchmark itself not just with other UK cities, but with those on the continent or in other developed nations too. Here our aim is to very much to be part of that wider policy debate about what cities like Manchester can and need to do to fully embrace cycling. Cities like Berlin have achieved major increases in cycling levels in a relatively short time-frame with similar levels of investment to that proposed in Manchester. Their investment in cycling infrastructure, promotion and education is now really paying off, as any recent visitor would tell you. Let’s make people say the same about Manchester in 10 years time. 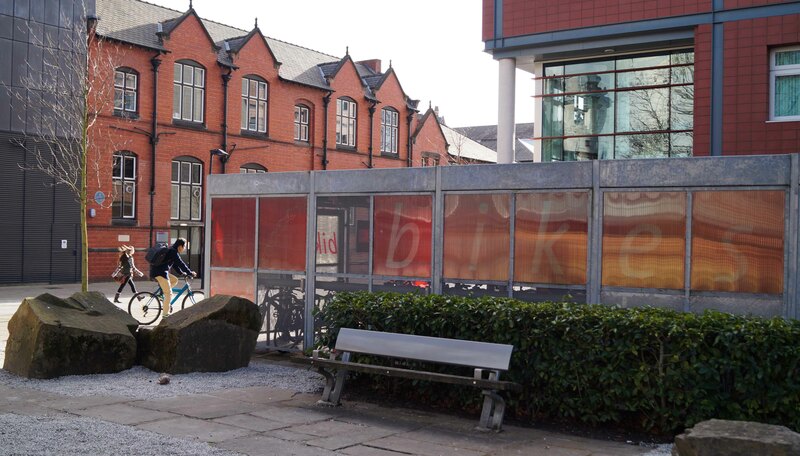 This entry was posted in Interventions and tagged Built Environment, Coalition Government, cycling, Manchester, Planning, Policy, Politics on March 17, 2014 by citiesmcr. Statistical boundaries and small area data: something worth saving? Statistical and small area boundaries are invisible on the ground. Yet they shape the physical nature of cities because they demarcate areas that are governed. And they are part of the construction of places because they determine a space that has political representation, or is served by a care trust, or is provided with services by a particular local authority. Statistical boundaries are ‘territorial units’ within the UK for which data are collected and collated by the national statistical agencies (Office for National Statistics in England and Wales, General Register Office for Scotland and Northern Ireland Statistics and Research Agency). The Office for National Statistics (ONS) provides a useful guide to the geographical boundaries it works with (http://www.ons.gov.uk/ons/guide-method/geography/beginner-s-guide/index.html). There are many types of sub-national boundaries for which small area data are produced – administrative, electoral, census, health, postal. And the boundaries within each of these types change frequently. For example, census boundaries change in an attempt to provide statistics that reflect geographical areas with some social meaning and amendments to electoral boundaries may reflect demographic change. Statistical boundaries both shape and reflect society. In the UK, statistics are produced for very small areas. For example, census data are published for ‘Output Areas’. Output Areas have a recommended size of 125 households and are generated from data after the completion of each census. Output Areas are designed to have similar population sizes to each other and to be as socially homogenous as possible based on tenure of household and dwelling type. Output Areas are small enough to sit within larger boundaries and always fit exactly within local authority districts. How might this type of data for small areas be used? Perhaps it is used by providers of health care or education in Manchester to tailor their services for their population. Perhaps it is used by the University to monitor how well it is engaging with the community within which it sits. Perhaps it is used by the local authority in population and economic forecasts. It is certainly used by academics interested in population change. For example, census data for small areas have been used in Dynamics of Diversity: Evidence from the 2011 Census Briefings produced by the ESRC Centre on Dynamics of Ethnicity (CoDE) in association with the Joseph Rowntree Foundation. These analyses of census small area data have revealed increases in ethnic mixing residentially (Simpson, L (2013); Catney, G. (2013), available at www.ethnicity.ac.uk). Indeed, such data allow us to identify places that are superdiverse, including Moss Side, the most diverse ward in Manchester district (Figure 2). They also allow us to examine where certain population groups have grown. 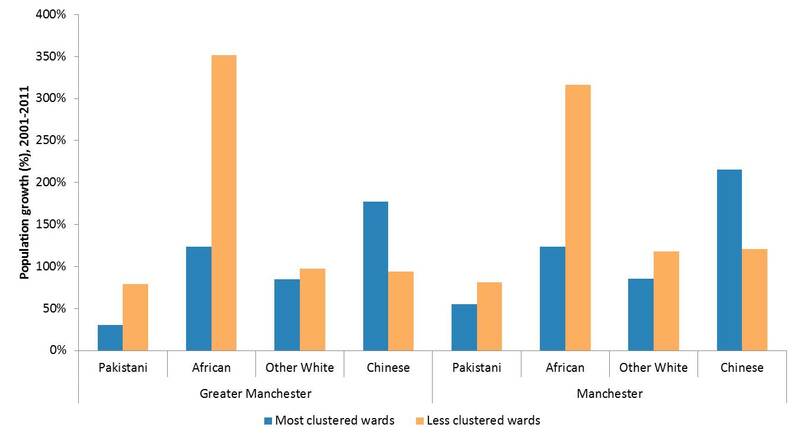 For example, Figure 3 shows that, between 2001 and 2011, the populations of Pakistani, African and Other White ethnic groups in Manchester and Greater Manchester grew more in areas in which these groups were less concentrated than areas in which these groups were most concentrated in 2001. 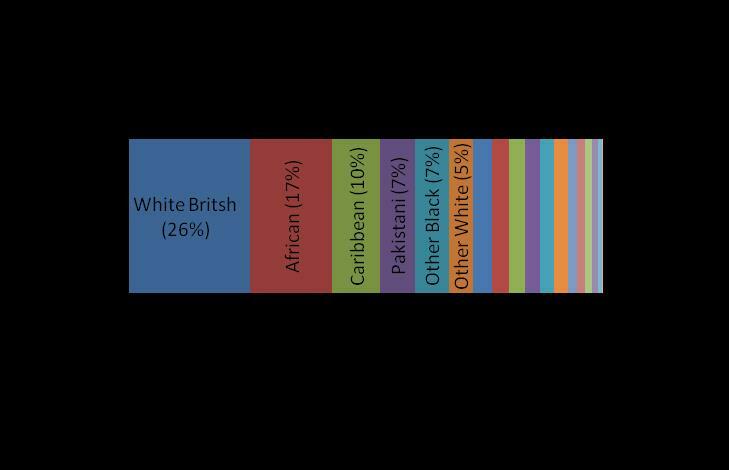 In other words, these ethnic groups have spread out residentially in Manchester over the 2000s. To the contrary, the Chinese population in Manchester district and Greater Manchester grew most over the decade in wards in which it was most concentrated in 2001, perhaps reflecting a growth in the Chinese international student population who settle in the central parts of the city where other Chinese people already reside. These patterns tell us something interesting about how Manchester’s population is changing, and allow us to speculate about and investigate what’s driving these patterns of population change. How else are small area data being used? Perhaps you have used them. Perhaps you have used them without realising their origins. Now is an important time to think about how these small area data are used. That is because they are under threat. The Office for National Statistics is currently assessing alternatives to a census for producing population and small area socio-demographic statistics for England and Wales. The review programme is called ‘Beyond 2011’ (http://www.ons.gov.uk/ons/about-ons/what-we-do/programmes—projects/beyond-2011/index.html). The impetus comes from the Treasury (Treasury Select Committee report ‘Counting the Population’, May 2008) and the UK Statistics Authority who would like to see feasible and less costly alternatives to the census that will make the 2011 Census the last of its kind. This call to find a less costly alternative to the decennial census came prior to the 2011 census. The 2011 census has been widely acclaimed as the most successful in recent times; efficiently run, cost-effective and producing a breadth and depth of data that is world-leading. ONS will have a public consultation on its Beyond 2011 proposals between September and November 2013 and will put its recommendations to government in 2014. The Beyond 2011 proposals may mean that small area data are not produced. It is a real possibility that the future data landscape in the UK will not include the world-leading breadth and quality of small area data that we currently enjoy. If small area data are to be included in the Beyond 2011 recommendations the case for them needs to be made. There is a danger that small area data will be lost because they’re taken for granted; because they are used by many, but their origins and the efforts to produce them, and their world-leading quality are not necessarily recognised. It is with this concern in mind that I urge you to consider the appeal by the Beyond 2011 Independent Working Group (Members of the Beyond 2011 Working Group are Piers Elias, Tees Valley Unlimited, and co-chair of Local Authorities’ liaison with central government on population statistics (CLIP); David Martin, Professor of Geography, University of Southampton, Deputy Director ESRC UK Data Service and National Centre for Research Methods; Paul Norman, Lecturer in Human Geography, University of Leeds; Phil Rees, Emeritus Professor of Population Geography, University of Leeds; Ludi Simpson, Professor of Population Studies, University of Manchester, President of the British Society for Population Studies). to provide examples of how you have used Census statistics, particularly for small areas (local authority level and below). These can be sent to ONS at benefits.realisation@ons.gsi.gov.uk and copied to the Independent Working Group at AreaStatistics@gmail.com. You may also want to respond to the ONS consultation in the Autumn. Perhaps it is helpful to think about this is terms of what we won’t have, and what we won’t be able to do, if we don’t have small area data. If small area statistical boundaries and the information about population, health, housing, education, work, migration that they contain were not to exist, what would we not know about cities, and about how cities are changing? How would our understandings of contemporary cities be different without the backdrop of the world-leading quality small area data that we currently enjoy? This entry was posted in News & Updates and tagged Coalition Government, cosmopolitanism, Manchester, Multiculturalism, Planning, Policy, Statistics on September 23, 2013 by citiesmcr. Urban Forum – Manchester: Towards a Just City? cities@manchester are organising a public panel debate on Tuesday 18 June at the Anthony Burgess Foundation. Full details here. Manchester like many cities at present suffers from growing divides, poverty and inequality. The Council has cut jobs and reduced services, while the centre of the city and surrounding retail high streets are blighted with a growing number of empty store fronts. With house prices stagnant or falling and unemployment levels across Greater Manchester continuing to rise, it is unclear how housing or labour markets can improve the living conditions of the local area. Some analysts point to possibilities for job growth from the creative industries and financial services sectors, but these opportunities remain as yet unrealised. In this research forum we bring together a number of stakeholders to explore where manchester is now, the challenges it faces and what it needs to do to become more at ease with itself and more socially just. In the current economic and political climate it can be difficult to get behind the headlines and uncover what the real situation is. Whilst the ongoing drive to cut spending dominates much of government thinking, it would be incorrect from a business perspective to say that all is lost and that there is no money available. Since the financial tornado struck in Autumn 2008 the private sector has borne the brunt of the maelstrom caused by a combination of seemingly reckless activity by banks and successive governments’ inability to react adequately to promote growth and help create adequate employment opportunities. The public sector too has suffered greatly from these tough economic times. Things are better than they were – this isn’t denying the seriousness of the situation – but let’s be clear this means flat or low growth. Our most recent Quarterly Economic Survey, completed by over 800 businesses, showed that one of the worst hit sectors, construction, showed some signs of growth. This sounds promising, but the reality is that this is from a breath-takingly low starting point. Some sectors have fared better but set against the broader economic conditions these results are often difficult to see. On the one hand private sector jobs figures remain positive but this is counterbalanced by weaknesses elsewhere, ensuring that the overall situation (for those out of work) is still challenging. However some of the present issues predate present experience and will need more than an economic upturn to rectify. Ask any employer about skills or rather the lack of them and it’s apparent we have a startling wide range of shortages. The figures make stark reading: with over 15% of Greater Manchester residents having no skills. The challenge of inadequately trained and work ready employees dates back to issues caused two or even three recessions ago. We feel the brunt now because of the acuteness of circumstances. Likewise the state of our high streets. Previous recessions dealt severe if not fatal blows to our large manufacturing base. This time around major high street chains – some of which have been around for generations – have gone out of business. However as we sit shopping on Amazon whilst shaking our head at the news of another boarded up shop, should we ask ourselves about the role we have played in this? One price of a reasonably robust level of employment is the significant rise of part-time working which has benefits as well as some obvious downsides. Yes, there are increasing numbers of high value, high skills jobs, but there are also plenty of low skill, low value jobs. We do have a part to play however in putting things right. The Chamber is tackling the skills issue through its Employer Ownership of Skills work, our members want to help reinvigorate our town centres; more businesses are showing an interest in trading abroad – those that do are better placed to develop and grow in the future. Whilst it can be dangerous to pick winners, it is sometimes more dangerous to ignore them. We have and always have had some world class businesses in Manchester, and many more aspire to be so. They don’t want special treatment just an environment that encourages enterprise which will allow them to grow and create the opportunities for the future so desperately needed to lead the economic recovery. They generally understand the social role they play and the impact they have on communities. I see this everyday and I see what can and must be done. It isn’t beyond anyone’s ability to make this happen but everyone has a part to play either as catalysts for change or giving support to those that take action. Books have been published, phds written, and raging debates held on what exactly it means to be a Just City. There isn’t scope in these few words to do any of that work justice, so I will take as my starting point a narrow definition that I think most people would broadly agree with: a Just City is one that provides equality of opportunity to all residents, especially the young. The interesting question then becomes: what can local policy makers do to ensure that all residents share the same opportunities in life? The weight of research tells us that the single most significant differentiating factor between those who succeed in life and those that do not is their level of skill. This underscores the need for a single-minded focus on improving education. This needs to start in the very earliest years, certainly before school and ideally from birth onwards, to ensure a radical improvement in life chances. At the same time, while improving educational outcomes across the spectrum is the archetypal easy thing to say but difficult thing to do, do it we must. The need to improve skill levels also holds for those who have left education and find themselves either unemployed or in low paid work. If that sounds too easy, it’s probably because it is. In the current economic climate there are two factors which mean making Manchester a more Just City is all the more challenging. First, despite the labour market holding up better than expected at the start of the recession, there is still a shortage of job opportunities. Public agencies have to focus on generating economic growth and jobs for our residents to move into. It would be foolish to focus simply on the distribution of wealth without concerning ourselves with where that wealth is to come from. Second, public sector budgets are reducing and the pressures on services that support many of our most deprived residents increasing. It is not enough to identify what more policy makers can do, we need to identify what can be done differently to achieve better outcomes with less money. Through its economic growth objectives and public service reform programme Greater Manchester is ahead of most places in tackling these issues head on and making the city a more just place. If we achieve all we want to, we might yet write the definitive book. Across the UK, and the world, we are in a moment of significant economic injustice. Things which have always been there are now in more obvious focus. Inequality knows no compass points in Britain today. There is a growing complex patchwork quilt of haves and have-nots. And yes in London too. In urban policy terms, neo liberal ideas around urban enrepreneuralism, where we just made it easy for global financial capitalism are being exposed and urban policy with a focus on manufacturing and industry struggles to find and alternative. Necessity may be the mother of invention, but it would appear in policy terms that the message of necessity has not yet got through. So we need to face up to some realities. Four things we need to do. 1. Recognise. The so called good times were not that good. Most historic and present economic development, basically hangs on to the half truth that a growing economy will lift people out of poverty – trickle down. However, even the good times were not that good for some areas. We cannot boom-goggle – A chronic condition of vision in which nothing is seen but endless boom just around the corner. We need to do something more progressive with growth, wealth creation, and redistribute in different ways. Tackling poverty is part of the economic answer and unless we do something about poverty, then it may be difficult to restore the kind of prosperity we would like. Our economy needs the poor to not be poor. Levels of disposable income are reducing local demand. Trickle up economics tells us that the poorest have a higher propensity to consume. They will spend a higher proportion of their income, usually locally. They must start earning and spending. Our businesses (especially our SME’s) need this. This relationship means, we have an irrefutable economic rationale for dealing with this shocking situation as regards low wages, underemployment and poverty. 3. We need to advance and accelerate new economic thinking. Local economic policy needs to catch up with this narrative and be bold. This is the future. 4. There is the need for a new economic activism, driving transformation. In this, we need the central state to set a better redistributive context. The poorest areas need more support, this is not jam spreading. It’s about giving the most in need more sustenance. We need a proper industrial strategy and a coherent set of initiatives. From there we look at the local state, to work to think about a new economic and social destiny. This includes things like the development of positive local multiplier outcomes, which means local sourcing, means local jobs, means more local spend. It’s also about a new local social and economic contract, with business at the front appreciating place, respecting public inputs to its success and working where it can to play more of an activist place role. Finally the economic sphere is not some opposite to social life. The aim of the economy, is to improve social life. This means creating an economy, which is not solely for private gain, but there to support social institutions for social development and a decent standard of living for all. This has to be the economic future. This is a just city. 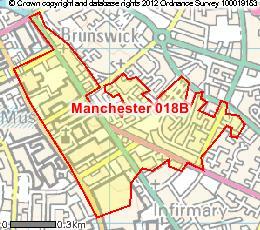 This entry was posted in Event and tagged Community, Manchester, Policy on June 17, 2013 by citiesmcr.